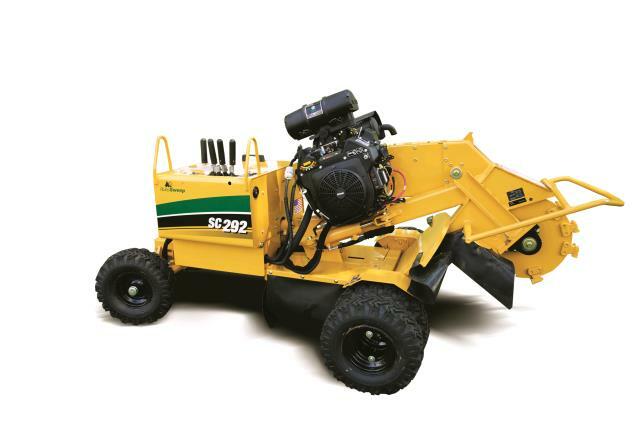 CUTTER WHEEL DIMENSIONS......... 17" x .5"
CUT ABOVE / BELOW GROUND........ 24" / 15"
The self-propelled SC292 stump cutter is equipped with a 26.5 hp EFI Kohler engine providing full-sized power in a compact unit. You can now fit into tighter spaces for more efficient stump grinding, with duals removed the unit is only 35 wide. Convenience and safety features include a hydraulic ground drive system, exclusive Vermeer Yellow Jacket Cutter System and operator presence handle system design that disengages the cutter wheel if the operator lets go of the controls. Reduce engine, drivetrain and structural stress in typical stump removal with the AutoSweep function that automatically adjusts the cutter wheel sweep rate. ** Please call us for any questions on our vermeer sc292 stump grinder rentals in Fairview Heights IL.